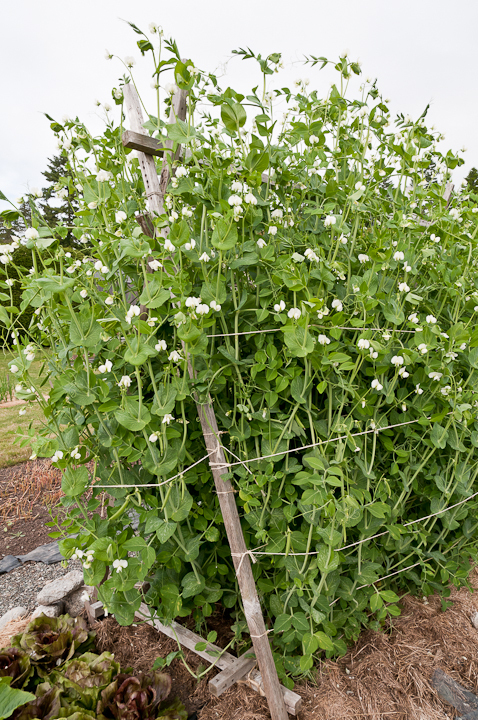 Sugar Snap Peas were introduced to the gardening world in 1979 and immediately won the year’s All-American Selections Gold Medal. That same year I moved from New England to the Pacific Northwest, a coincidence that comes to mind because I can still visualize the trellis of these new high-climbing peas stretched out along the narrow garden bed on the north edge of the tiny lot that surrounded our first house in Seattle. And I remember my delight at the taste: a crunchy, entirely edible pea pod that tasted like the very best shell pea. I’ve grown them every year since then as we’ve moved to new houses and made new gardens, finally ending up on Lopez Island in 1992. I’ve tried some of the variations on this original sugar snap—Super Sugar Snap, Cascadia—but the flavor simply doesn’t measure up to the original. Yes, the original Sugar Snap is susceptible to powdery mildew but I’m willing to put up with that to get the taste. For years I direct seeded them, hoping that rodents and birds wouldn’t eat all the seeds or new sprouts. Row covers helped deter these pests but I often needed to replant. Then a few years ago I began starting the seeds indoors in 1-inch cell trays. By carefully setting each seed a half inch deep with the hilum down and keeping the soil barely moist, I got nearly 100% germination. Here in zone 7B I start seeds in mid-February and set them out a few weeks later; I plant a second crop in mid-March. Even in those years when the seedlings grow a little taller and are more root-bound than I’d prefer before setting them out, they grow quickly once they are in the ground. And they do grow tall—Jack’s beanstalk comes to mind—climbing to the top of our seven-foot A-frame pea trellis and then on up into the sky. Each year I’m amazed by how short the time is between the first white blossoms and the first fully formed peas, just a few weeks. The temptation is to pick some right away but I’ve learned that the sweet flavor isn’t there until the pod is full and fat. Then I get my scissors. Cutting the stem rather than pulling off the pea is easier on the vine and the harvester. The miracle of Sugar Snap Peas is that you don’t have to shell them to get the sweet pea flavor, but you do have to string them. Put a knife at the blossom end and zip the narrow green string down the inner curve then zip back down the outer curve. 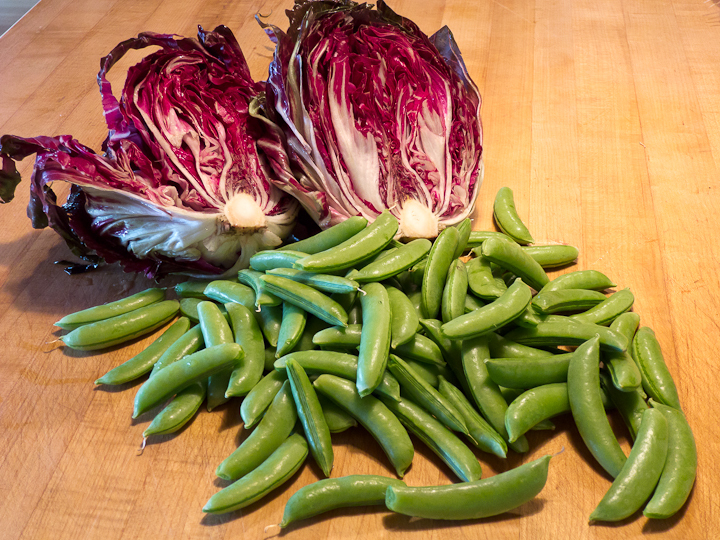 This task can be as restful as shelling peas and there’s less to compost. And then to the kitchen where the simplest preparation is the best: for a pound of peas melt a tablespoon or so of butter in a skillet, rinse the peas and toss them in with just the water clinging to the pods. Stir-fry for five minutes or so, as the matte green turns to bright green and the sweet pea flavor intensifies. While they are delicious alone, hot or at room temperature, they also mix wonderfully with other flavors. I picked some radicchio the other night and discovered a recipe on the blog Liking Pineapples http://likingpineapples.com/sides/157-pea-radicchio-salad that combines Shell Peas, radicchio, Pecorino Romano, lemon and olive oil. 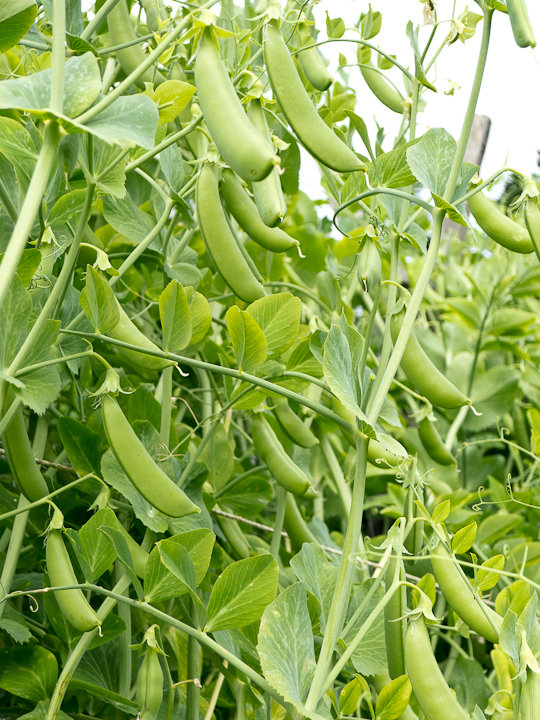 Sugar Snap Peas are a fine substitute for Shell Peas and the salad is fantastic, one more reason to plant Sugar Snap Peas each spring. This entry was posted in Spring Vegetables and tagged http://likingpineapples.com, Radicchio, Sugar Snap Peas by Lopez Island Kitchen Gardens. Bookmark the permalink. I can practically taste these peas and hear them crunch as I bite into one! Yum!! Summer in a little green suit.